"Open Fire. All Weapons. Dispatch War Rocket Ajax To Bring Back His Body"
"Flash, aaaaaaaaaaaa, Saviour of the Universe" When I emerged from my Dark Ages, one of the first things I discovered was Flickr. What a marvellous place, full of images of wondrous Lego creations. Such joy. Such inspiration. Looking back at some of the first things that I faved, I re-discovered this micro space Flash Gordon ship. 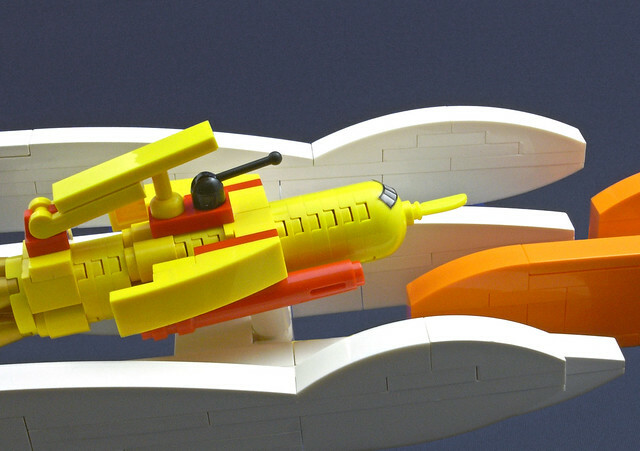 I love the film and the camp, comic book imagery and this MOC by halfbeak from August 2012 captures the look perfectly. I had never really considered Micro Scale as a serious medium until this. "Flash, Flash, I love you. But we only have twenty four hours to save the Earth!"